(Nanowerk News) VMatter, a new premium cutlery manufacturer, the first company in the world to introduce a cutlery collection made out of a revolutionary amorphous metal alloy, announced today that it has launched a crowd-funding campaign to help build its product line. The collection, which will include an 8" Chef’s knife, an 8" Slicing knife, a 7" Santoku knife, and a 4” Paring knife, is currently scheduled for a December 2013 retail debut. The Chef’s knife, the first product to be introduced in the line, will be available in two different versions: the Professional Edition, with nano-scale edge sharpness, for $247 retail; and the Executive Limited Edition, featuring a stabilized rare hardwood handle and personalized laser engraving, for $397 retail. 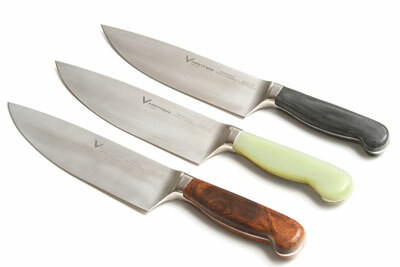 All the VMatter knives will be made from their exclusive amorphous alloy. This alloy has no grain boundaries, which are responsible for the weakness inherent in all of the world’s finest steel. The VMatter alloy retains the best properties of both metal and glass, as it is literally a metal with the atomic structure of a liquid. The use of the alloy makes the knives extremely durable as well. For example, VMatter prototype knives have demonstrated sharpness lasting years, not weeks, which is the current benchmark in the retention of a sharp edge. Additionally, the metal is 20% lighter and 330% more elastic than steel, 250% stronger than titanium, and highly resistant to corrosion. “The combination of these elements gives VMatter Cutlery the potential to revolutionize food preparation in the home and in commercial kitchens,” said Blair Dahl, President of VMatter. Remaining true to its West Coast beginnings, VMatter proudly designs and assembles all of its products in California. VMatter is the result of the collaboration between CEO and Founder James Kang, a pioneer in the field of amorphous metal alloys, and President Blair Dahl. Kang developed the methods and machinery that mold the metal alloy into useful net shape parts (meaning the initial production of the item is very close to its ultimate final shape), making the VMatter cutlery line possible. Dahl is a successful entrepreneur with substantial experience building companies from the ground up. His core business was built on serving manufacturing sector businesses in Southern California for the past 25 years. Together, Dahl and Kang created the perfect application for the material used in VMatter cutlery. Durable Edge – The sharpening cycle is greatly extended without making the knives brittle, which is an issue with ceramics and even the hardest steel. Sharper Edge – Nano-scale sharpness is derived from its glass-smooth atomic structure. Anti-Bacterial Technology – Bacterial growth is inhibited by VMatter’s glass-like surface. Value – One VMatter knife outlasts multiple steel knives. No Metal Taste – No metal residue is transmitted to food. No Corrosion – Having no grain boundaries and a Zirconium-based chemistry eliminate corrosion. Perfect Weight – 20% lighter than steel knives with perfect energy transfer and balance.